Q. What do I do if I see a swarm of bees? A. Don’t panic: bees in a swarm are universally in a good mood. They cannot easily sting even if antagonized as they have gorged themselves with honey and cannot get their bodies into the best position to sting. If the swarm is not causing a nuisance then leave it be or find a beekeeper to come take the swarm away. See our Services page for a Swarm Removal referral list of SFBA members who will remove swarms. If the swarm is not captured and removed, it will cluster in a bush or tree and remain there for up to three days. During that time scout bees will search for a suitable location for the swarm to establish a new nest. Q. Why do honey bees swarm? A. A honey bee colony will swarm because it has thrived sufficiently to have outgrown its current nest site. The existing queen with approximately 50% of the bees will swarm from the current nest site and seek a suitable location to build a new nest. The remaining 50% of the bees will remain in the current nest site. Shortly after the colony swarmed, a new queen bee will hatch and, if she successfully mates, will perpetuate the colony until it again swarms. Q. How do beekeepers catch a swarm? 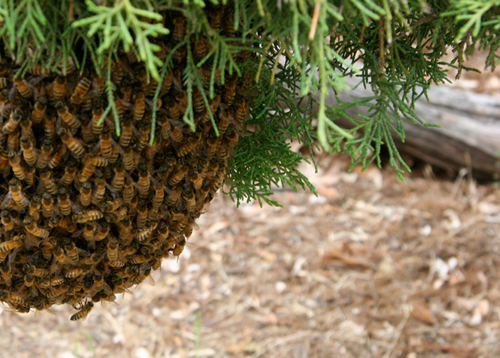 A. Beekeepers usually catch swarms when the bees collect on a branch of a tree or bush. The beekeeper simply shakes the swarm into a cardboard box that can be secured and has adequate vents. The swarm is then taken to a hive, the box opened and the bees simply shaken into the hive or the box is opened in front of the hive for the bees to enter the hive. It is a dramatic sight to see a swarm marching into a new hive. Click here to contact local beekeepers to rescue bees.